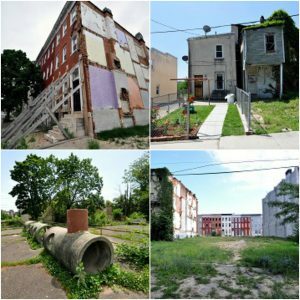 Top Left Clockwise [PHOTO CREDIT: Amber Collett] Owned/Abandoned: The drastic difference between an owned and a vacant property. Imagine what could be if more houses were revitalized and made into homes. Failing House: Rowhouses are meant to support each other. When one is demolished, it threatens the structural integrity of those around it. In this case, a neighboring house was demolished, the new external wall was left unreinforced, and a homeowner was left unsupported. Playground: Leftover concrete sewer pipes were repurposed as playground equipment during the 1960’s installation of inner block parks in West Baltimore. Rowhouses & Lots: The view from an inner block park to the adjacent street wall through vacant lots. What causes these spaces in the first place? And who participates in, and benefits from, outside intervention? These are words used by residents of Baltimore’s Harlem Park community to describe their neighborhood. When homes are crumbling and ‘playgrounds’ are concrete sewer pipes painted to looklike trains, you understand: This is planned obsolesce at the neighborhood scale. In the wake of decades of objectification and abandonment, residents are striving to create lives that are not diminished of opportunity. The box of flowers on the front step of an abandoned house. The unauthorized and thriving garden in a vacant lot. The meticulously cared for home surrounded by abandoned buildings. These actions of healing and reclamation call forth dignity despite overwhelming institutional obstacles. As demolitions and renewal programs expand, we’re confronted with a question: what conditions are necessary to expand an ethic of care beyond one’s self? If dignity and well-being for all were the goal, we would talk not about what is technically wrong with a neighborhood, but about what can be done to subvert the systems of power and control.We would all be called upon to cultivate love; those subversive acts of human kindness that become direct, substantiated, and revolutionary acts. The street art and gardens in Harlem Park are just such acts; they represent a calling for us to witness and to care.When allowed to flourish, these loving acts are what truly disrupt systems of corruption and create more resilient communities. Amber Collett is a Masters candidate at Yale F&ES. She has more than a decade of experience involving wildlands protection, urban planning, and affordable higher education. Her research explores perceptions of wellbeing, civic engagement, and the conceptions of relatedness.